Manish gets angry on Kartik for his drunken incident. He loses hope of KaiRa’s union. He asks Kartik if he isn’t aware of his parents’ sorrow. He tells Kartik that he won’t like to live this way, as he has lost Shubham due to his addiction. He asks Kartik to realize his responsibilities towards the family and not be so selfish. He asks him not to be self-centric and think for his dad, who can’t fight with the situation for more. He tells Kartik that he never depended on alcohol, when he faced Kartik’s hatred. Manish gets too emotional and begs Kartik to return him his son. He asks Kartik not to get away from everyone’s hearts, he can’t lose out in life. Suwarna tells Kartik that Naira’s love made him weak. Manish stops her from saying nonsense. He tells her that love just gives strength, love can never ruin anyone. He asks Kartik why didn’t he try to save his relationship, why isn’t he listening to the family. He refuses to support Kartik in his madness. He gets too hurt because of Kartik losing out. He gets fed up of Kartik’s drama. He tells Kartik that he will ask the court to grant him divorce soon, so that they all get done with it. Manish loses strength and tells Kartik that he will not tolerate Kartik’s leaving. He asks Kartik to end everything with a single strike, than hurting them every day this way. 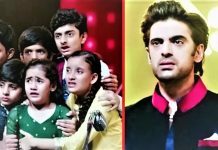 Manish’s bitter words gets heard by Naira and her family. Manish apologizes to everyone and asks Kartik and Naira to get separated. Naitik understands his sorrow and pain. He also feels the same pain being Naira’s father. He tells Manish that he had to hear this and understands that he has fallen helpless. Manish tells Naitik that he has given up all their hopes, as the children are really disappointing. Suwarna still feels Naira is responsible for Kartik’s suffering. She wants Naira to leave Kartik forever. Naitik tells Manish that Kartik and Naira will do what they want, nobody can force them to keep or break the relation. He asks Manish not to break the hope, there is less time, but anything can happen if God wills. Surekha and Rukmani ask all the couples to apply haldi to Mansi, to make the ritual auspicious. Naksh asks Mansi not to be upset, since she is the bride. Lav and Kush ask Mansi to run away than being upset this way. They promise to handle everything. Rukmani gets bothered by worries. She has to pay for the jewelry bought for Mansi. She tries to get some cash to pay to the jeweller. Kartik and Naira apply haldi to Mansi together, and recollect their haldi ceremony. Mansi wishes to see them together. Naira asks Mansi why is she crying in her haldi ceremony. Mansi’s mood spoils by the family drama. Rukmani tells Goenkas that they will soon come with the baraat and take the bride home. 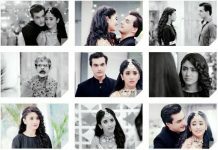 Kartik and Naira think once the marriage ends, they won’t be facing each other. Kirti asks Naira to wear a wedding dress and get decked up ready. Kartik’s clothes get spoiled. Lav and Kush ask him to change his costume. 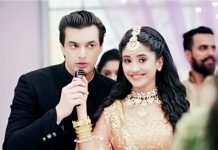 Kartik recollects Naira all the while. Naira gets dressed in her bridal wear, and misses Kartik.